This thriller examines the damage of the Global Financial Crisis on wealthy businessman Robert Miller (Richard Gere) who is in the deep. His business is in trouble but he needs to make a deal with a major bank so that he will be financially secure again. He opts to borrow someone's money and put it in his own account temporarily so that when an audit is completed he will appear financially viable. Meanwhile, his own family life is equally as complex. He spends lengthy periods of time away from his wife (Susan Sarandon) and their children, including his daughter (Brit Marling) who works with his trading business. It is also revealed that away from them Robert is having an affair with an art dealer Julie (Laetitia Casta) but their relationship is rocky too. One night they are in a terrible car accident together and Julie is killed. Robert flees from the wreck with a minor injury and acquires the help of an old friend in Jimmy (Nate Parker), a young man whose family Robert used to help support. Both Robert and Jimmy are hounded by Detective Michael Bryer (Tim Roth), who is sick of seeing the rich walk free. Arbitrage (pronounced ar-bi-tridge) is a financial term that refers to buying and selling in two different markets. In the context of this film, it could also suggest the manipulation of separate and unknowing groups of people. The trouble with this very minor thriller from first time writer-director Nicholas Jarecki is that you won't spend very long afterwards contemplating ideas like this. The film is well photographed and competently acted but hardly unique. It is another GFC film disguised as a thriller, but lacking the moments of heart stopping danger and tension to make it truly involving. There have been a lot of films recently about the GFC through various angles. 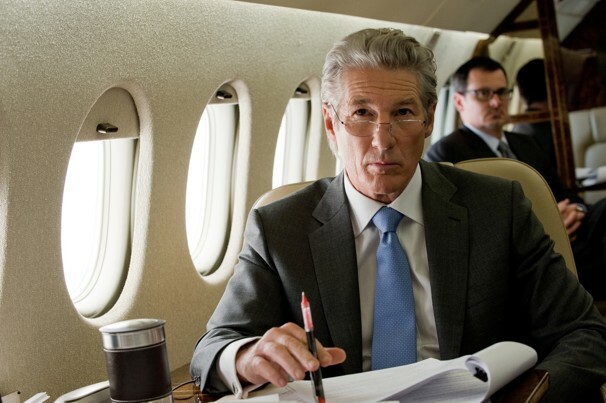 Some of them have been hearty dramas (Up in the Air, 2009) and others complex financial essays (Margin Call, 2011). 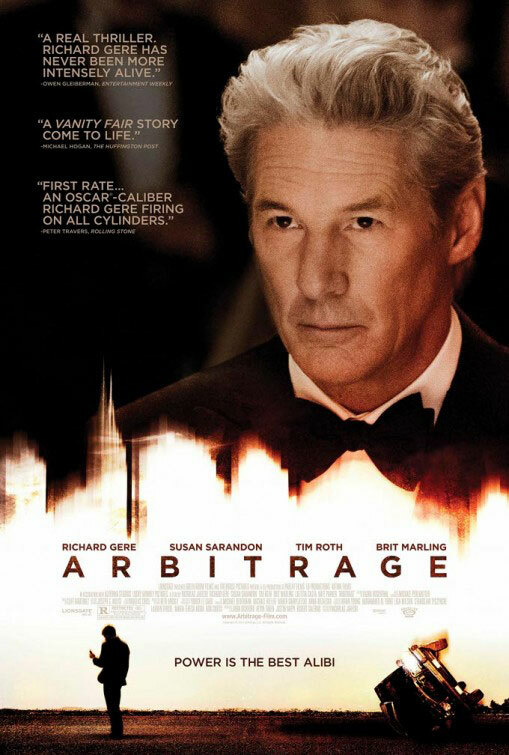 But unlike those two films, I don't think that Arbitrage has the capacity to tell people about the state of the world in years to come. The financial aspect is mostly clear, even for someone who has little interest in this aspect which is helpful, but there is too much filler in the movie. There are many scenes of long tracking shots and far too much driving. The tracking shots, focussing on Miller's movements away from people, could be representative of the class division and that he literally moves in his own circle. But no matter how visually efficient the film is, the pace is hampered and dreadfully slow, even at 100 minutes long. In fact, so understated is the drama in the middle portion of the movie, that the film is surprisingly dreary and monotone when the material sounds timely and potentially exciting. I wondered if this was a result of the character of Miller and the way that he is played. He is described in the film's production notes as "charming" and "sympathetic" in his moral ambiguities. A more apt word is slick because Gere has retained that natural quality but his character seems imbalanced and the performance one-note. Miller is having an affair, spends little time with his family because of work, and by the end is forced reluctantly into another lie. He is meant to have helped Jimmy's family long ago but it's still hard to sympathise with him and the film is less involving because of that. There are other problems with the cast too, such as Susan Sarandon being horribly underused until a late final scene that is quite powerful. That is disappointing because the film has all the tropes of a great thriller and opportunities for heart. The decay of Miller's family should have had a far greater emotional resonance instead of being this dull and uninvolved.